It’s hard to face up to the reality that sometimes bad things happen to good people with no rhyme nor reason. Since just before Christmas there have been things that have been happening in my life that made me have to step away from geek adventuring for a while. On the days where I just wanted to give up, I watched Firefly because it made me hopeful. On the days I didn’t want to speak to anyone, I revisited old friends in the guise of Buffy and the Winchester Brothers. On the days I was panicked about what was ahead, I calmed myself with some episodes of Arrow . And when I wanted to hide in my bed, it was Terry Pratchett and Billy Bryson who kept me company. I wondered if my default setting of ‘annoyingly cheerful’ had been reset and couldn’t be changed back. I felt a turning point last weekend though after a trip to Newcastle Film and Comic Con. I had booked the tickets before Christmas and hadn’t really thought about it much until a few weeks ago. 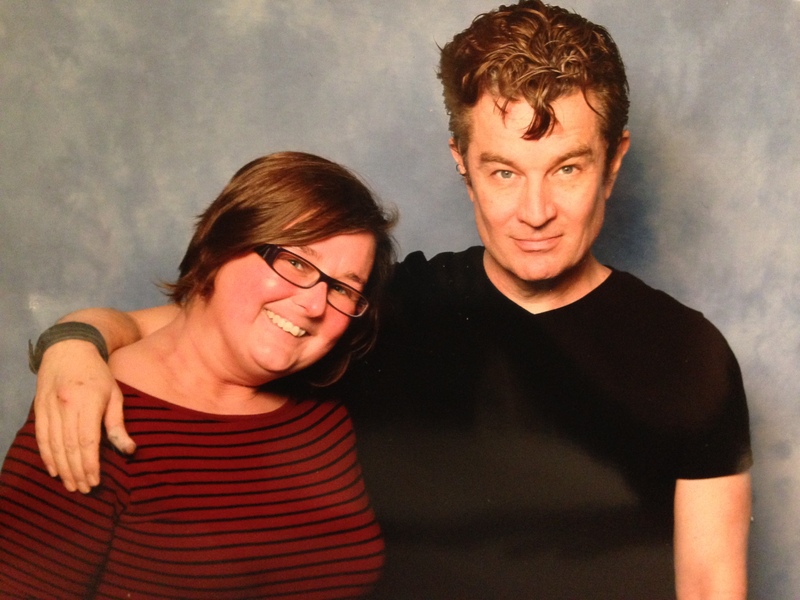 The reason I had booked them was because James Marsters (AKA Spike from Buffy) was going to be there and I was determined to cross item 21 off the list Meet a Vampire. There was NO WAY I was going to miss the chance to meet a Buffy star! You could grate cheese on those cheekbones! Waiting in the queue to meet him I felt the old familiar butterflies in my stomach. I flushed when I spoke to him and he was as charming as I had hoped he would be. After my photo and autograph I bounced away with a big grin on my face. I felt like myself again for the first time in a while. I was eager, enthusiastic and excited. The cloud that had been hanging over me gave way to a chink of light. 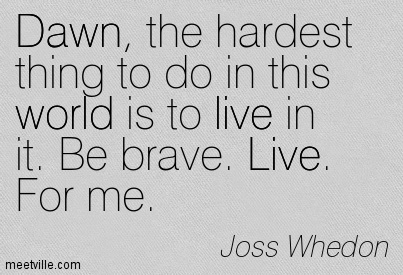 As always, I turn to Joss Whedon to help me explain how I feel. When things are at there worst I watch Remembrance of the Daleks, so totally understand where you are coming from here. There’s always something that helps you get through!